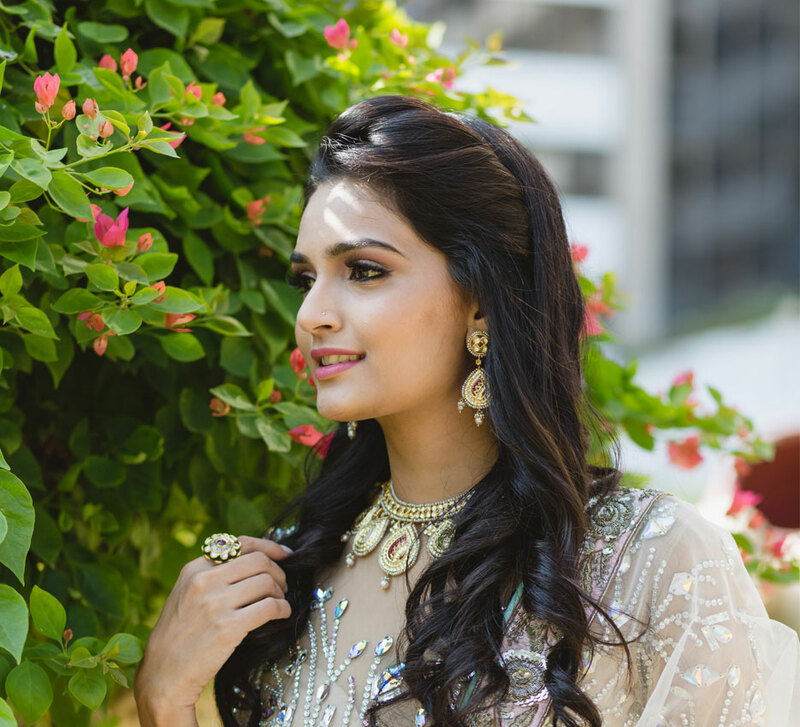 Wearing a lehenga by Manish Malhotra, jewelry by Tanishq, and a stunning makeover, courtesy Lakme, bride-to-be Ayesha lived her dream before the big day! WeddingSutra’s popular bridal initiative ‘WeddingSutra On Location’ took place against flamboyant backdrops at Taj Lands End, Mumbai. 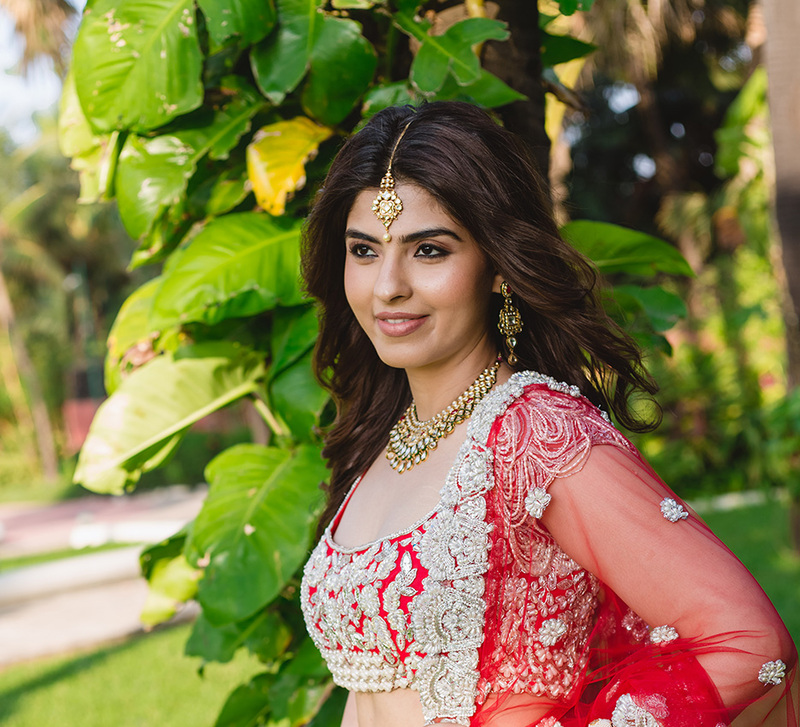 In the second of this three-part series, bride-to-be Ayesha’s contagious smile and unmatched grace were only accentuated by her makeover. New makeup trends are a relentless tide in an ocean of options. But while some will disappear like the surf, the Golden Glow is here to stay. Shimmying up to the shimmer, bride-to-be Ayesha’s inner diva was unleashed by makeup artist Sejal Sachnakul of Makeovers by Sejal. With products from Lakmé’s latest range, the Kareena Kapoor Khan Lakmé Absolute, and with her expertise, Sejal painted her a glowing visage while Manjula Sachin Jadhav styled her luscious locks. To complement her vibrant personality, the team chose intricate gold jewellery by Rivaah by Tanishq. The brand’s exquisite craftsmanship delivered the perfect glam quotient for each outfit designed by Bollywood’s most popular, Manish Malhotra. Redefining the ethnic aesthetic with luxuriant embroideries, his lehenga brought to life a dream for our filmi bride-to-be! A bejeweled clutch completed the look, and Ayesha was ready to turn heads! Natasha Samant of The Storyteller was behind the lens all day, turning every significant moment into an everlasting memory. 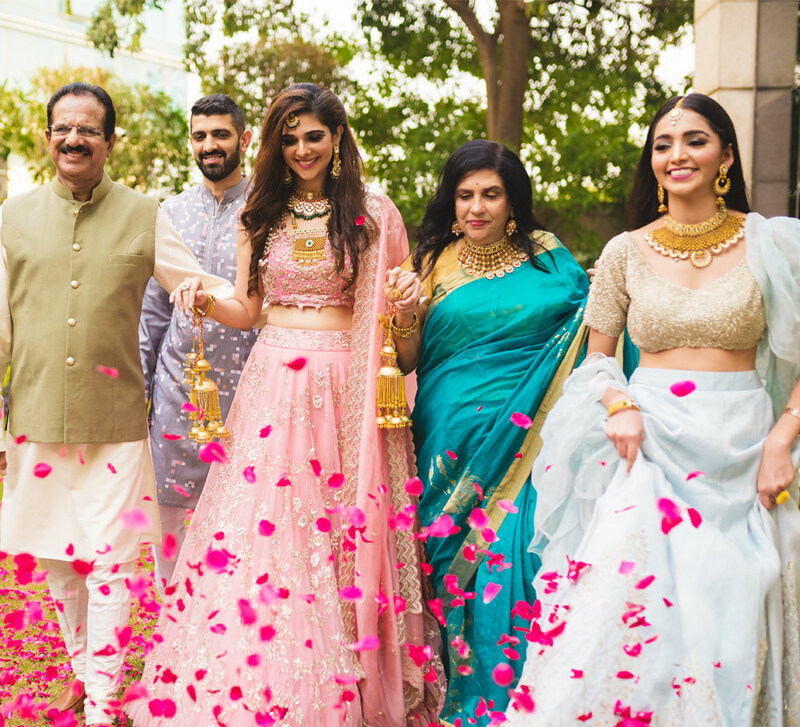 Ayesha summed up her day with warmth and gratitude, saying, “I’ve been following WeddingSutra for a long time. I’ve looked for inspiration across their offerings and love their coverage of featured weddings. Today has been a glorious ‘Test Run’. I now have a decisive list of what to do and what not to do. For example, because the shoot was on a manicured lawn, despite the help from the team, I’ve realized I can’t wear stilettoes! I’m going to have to wear wedges on my big day or I’ll keep sinking into the ground. That Golden Glow on Ayesha featured subtle flecks of shimmer and tinges of gold. Makeup artist Sejal summoned the sunshine by beginning with an application of the Lakmé Absolute Argan Oil Serum Foundation in Ivory Cream.She then used the Lakmé Absolute White Intense Wet and Dry Compact to set the foundation. With the Lakmé Kareena Kapoor Khan Absolute Face Contour - Natural Light, Lakmé Kareena Kapoor Khan Absolute Cheek Contour and the Lakmé Absolute Illuminating Shimmer Brick she illuminated the skin with a fine shine. For the subtle make-up on the eyes she used Lakmé Absolute Illuminating Eye Shadow Palette – Gold and the Lakmé Kareena Kapoor Khan Absolute Eye Definer. And finally, adding to the stunning contour, Sejal used the Lakme Kareena Kapoor Khan Absolute Pout Definer - Mischievous Love for the perfect pop of color to Ayesha’s lips.